Waterfront Toronto will hold a public meeting tonight to present the current status of the review of plans for the Port Lands. This was supposed to be the final meeting, but the study period has been extended through the summer and the report to Council will now occur in the fall. At yesterday’s board meeting, Waterfront Toronto CEO John Campbell indicated that there would likely be a fourth public meeting to review the final report in August. Tonight’s meeting will be at the Convention Centre, Room 105, North Building, 255 Front Street West from 6:30 to 9:00 pm. There will be an update meeting on the West Don Lands in The Great Hall at St. Lawrence Hall, corner of Jarvis & King, on May 29 from 6:00 to 8:00 pm. The project to rebuild and reconfigure Queen’s Quay from Spadina to Bay will get underway in August, although some utility work has already begun. 509 Harbourfront streetcars will be replaced with buses at the end of July. There will be two presentations of detailed information on Central Waterfront projects and on the construction plans. The first is on Wednesday, June 6 from 7:00 to 9:00 pm in the Brigantine Room at Harbourfront (Lower Simcoe & Queen’s Quay). On Saturday, June 9, from 10:00 to 2:00, there will be a drop in at 20 Bay Street in the lobby. The complete reconstruction project is expected to take 2½ years. Between Bay and Jarvis Streets, Queen’s Quay is a bit of a mess thanks to construction and to removal of the Redpath rail spur. Waterfront Toronto’s board has now approved a project to rebuild the south edge of the street with a new sidewalk and cycling path. A major part of this project will be the reconstruction of the aging Jarvis Slip dock wall both to repair the 60-year old structure and to modify its anchoring system under Queen’s Quay to make room for new hydro and telecomm ducts that will eventually serve developments in the eastern waterfront. As for transit on Queen’s Quay east, Waterfront Toronto commissioned a study of alternative “interim” configurations pending the construction of the full planned LRT route. Although over 200 permutations of options were on the table, this has been narrowed down to 8. WFT will undertake an amendment to the transit project’s EA, and consultation for this will begin in late June. The list of options will probably not surface until that time. The track strings for Cherry Street are now sitting across from TNT Foods just south of Commissioners Street. Construction is well underway on Cherry which is closed from Lake Shore north. Thanks to Jacob Louy for bringing to my attention a notice that the TTC has begun work welding track for the Cherry Street line. The right-of-way for streetcars will be constructed as part of the Cherry Street project now underway, and this notice confirms that streetcar track will be included in the original construction even though streetcars won’t likely run here until after the Pan Am Games in 2015. The track assembly is taking place near Cherry and Polson near TNT Supermarket and far from the existing streetcar system. The last time streetcars were in this neighbourhood, they were on a boat heading for Egypt. 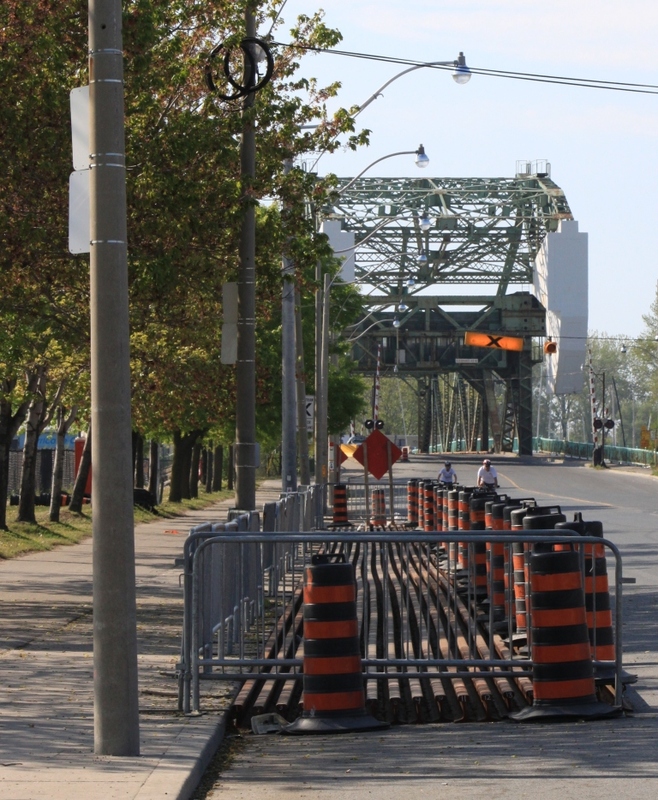 Who knows when we might see track installed on this part of Cherry in the Port Lands. This from Waterfront CEO Report to their Board on May 23. A consulting team has been hired to develop interim transit options to service EBF. The study is looking at various modes of transit including Bus Rapid Transit and Light Rail Transit that can be delivered within the existing funding envelope. Options will be evaluated according to their cost/ benefit and ability to build upon the approved EBF Transit EA. Recommendations are expected in July 2012. Steve: Yes, there is supposed to be some sort of public input to this process in late June. What about replacing the Union Loop with terminal tracks and platforms instead of a larger loop? I realize that there would have to be more switches and it would make double-ended cars necessary…but there would be benefits: space for more passengers (with parallel platforms) would reduce the crowding & lines backing up into Union Station, multiple cars (or trains) on different routes could use the terminal, and passengers could embark & disembark faster (assuming that track switches move quickly enough). Finally, cars or trains could lay-over or stay at Union loop. Steve: You can’t put crossovers between the two existing tracks because of the support columns holding up the railway. Also there is the small matter that the LFLRVs are ordered as single-ended. We have had enough delays getting new cars without that change too. The more I think about it the more I like Nathanael’s idea. In the immediate short term we could make do with surface tracks up Bay (maybe not even in private ROW) to Wellington and have an on street loop that reaches West to York, North to Queen and East to Church. In this form it can’t handle all the service planned for the Waterfront in the long term, but adding a private ROW and a better terminal in the longer term would help, as would increasing the emphasis of services heading downtown via King. In the longer term if this were extended up Bay and West on Front we might just be able to avoid such a complete rebuild of the Union loop by using it only for Spadina and Bremner (I agree about the indefinite delays but think that it will happen eventually of necessity unless we somehow get the DRL down into the railway lands first), runing the 509 on Nathanael’s Spadina/Front/Bay route and any second Eastern route up Bay somehow (the on street could work for a while… but I doubt it would be functional in the longer term). At the end of the day to me the question here is how does the cost of an interim (no ROW) track connection down Bay from Wellington compare in cost to the tunnel portal? It’s quite a bit of track, but that portal is really getting complicated and expensive, and in fact a shorter section than was needed to connect the original Harbourfront line to King (albeit with pretty solid plans to build a line on Spadina already in place). Steve: As I have already written, the redesigned Front Street that will appear after the subway station expansion is completed does not have room for an LRT right-of-way or an interchange to the subway. As for Bay Street, there is no way you are going to get a right-of-way there given the existing traffic of autos on the street and pedestrians crossing it. We need to stop messing with stop-gap “solutions” that cause as many problems as they solve, and concentrate on actually funding and building the eastern leg of the Harbourfront line. I get the feeling that the surface-on-Bay street option isn’t going to die off anytime soon, despite the potential impacts on transit service and traffic. I agree that this scheme is not perfect, but neither is the situation to begin with, nor any other alternatives. Besides, when was the last time we had a perfect opportunity with perfect conditions to build a perfect transit solution? And it’s not like anything we build has to be permanent either.